Another odd duck in the collection, I thought it might make a nice companion / comparison model to display with the Ar 196. The Vought Kingfisher stemmed from a contract placed in 1937 for one prototype. The prototype flew for the first time on July 20, 1938. 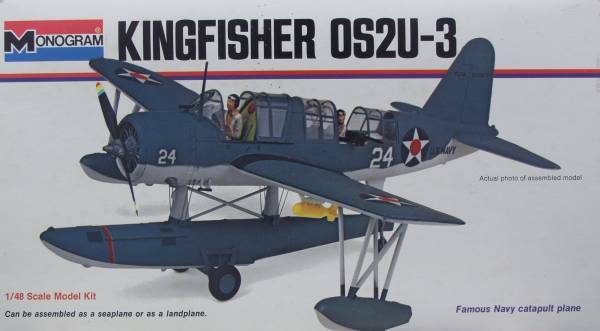 After a few minor changes to the design production was begun for the U.S. Navy as the OS2U-1. The first production aircraft flew in April of 1940. The aircraft was the first to employ spot welding of a primary aircraft structure which created a non-buckling fuselage structure. 54 OS2U-1's were built followed by 158 -2's which differed only in service equipment and a later engine version. The primary production model was the -3 version which first appeared in the Summer of 1941. The -3 was externally similar but it featured an additional two 31 gallon self sealing fuel tanks and 187 pounds of armor for the pilot and observer. 1006 examples of the -3 were built plus an additional 300 designated OS2N-1's were build by the Naval Aircraft Factory. The Kingfisher's were used as fleet defense in the early days of the war becoming the "eyes" of the fleet both for defense and for shore bombardment missions. They are credited with sinking two German U-boats and a Japanese I-boat. It's most important role turned out to be rescue of downed airmen and was second only to the Catalina in that task. Perhaps its most famous rescue being that of Captain Eddie Rickenbacker. The Kingfisher served the entire war, one having been on the Arizona when it went down at Pearl Harbor and one was on the deck of the Missouri when the Japanese signed the treaty ending WWII. The Monogram kit has been around since the late sixties and for its time was very nice. It did have a number of flaws, the most noticeable being the main float, which due to limitations of the time, was made 35% under sized. The wing floats were not shaped quite right and the interior detail was a bit sparse. In 2001 Cutting edge released a detailed cockpit, a replacement main and wing floats and a replacement cowling and after seeing the difference these parts made I decided to do one myself. This kit has been released many times since it originally hit the shelves. The release I have cames in a two part top open box with a nice photo of the built model on the top. The box has the Mattel logo on it so it was made in the mid 70's. The parts were not bagged as that wasn't a common practice back then and a number of parts were off the sprues when I got it. 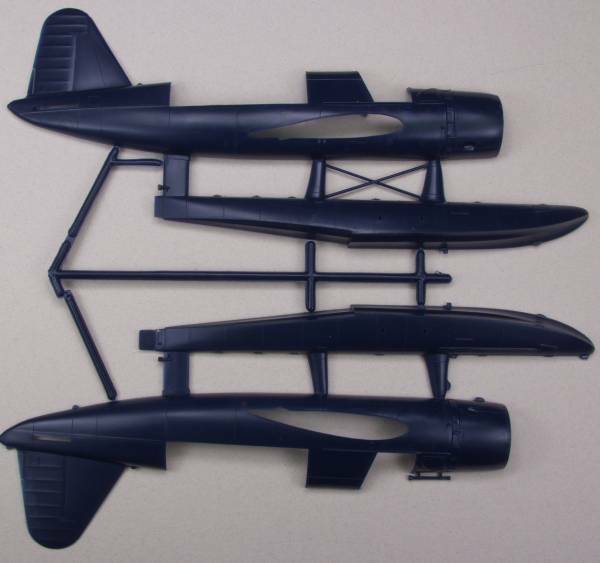 Typical of most of Monogram's naval aircraft the kit is molded in a dark blue color. The panel lines and rivet detail is raised as was the norm back then. The major air frame parts had no major defects and only a light amount of flash. I did find some surface marks on the bottom wing half where there are indentations on the inside to make drilling holes for the rigging easier. I don't think these will be visible enough to warrant the time it would take to fix them. There are ejector pin marks on the under side of the horizontal stabilizers that will need to be fixed. The control surfaces are all fixed in the neutral position and the fabric detail is reasonably well done. 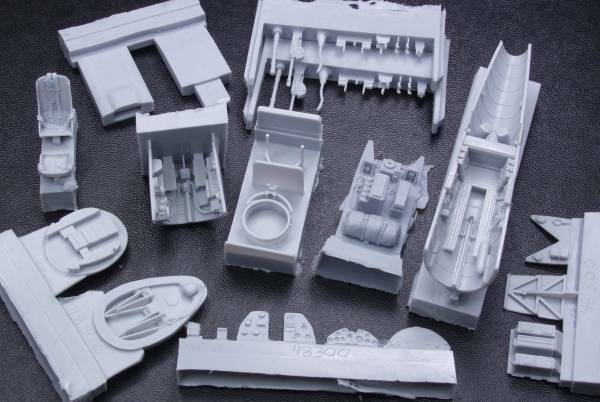 The kit supplies parts for the land based version without floats. The kit does include beaching gear making display easier. Altogether there are 49 parts in dark blue. The clear parts are are thin and clear and even though they were not bagged had not accumulated many scratches. The canopy is molded in five pieces so it can be displayed with both the pilots and gunners position open. 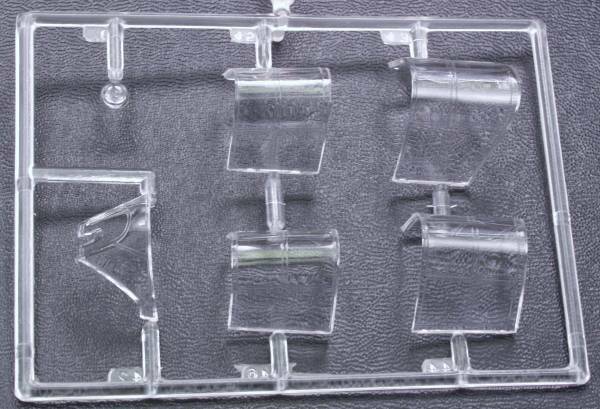 There are six clear parts for a kit total of 55 parts. See photos below. 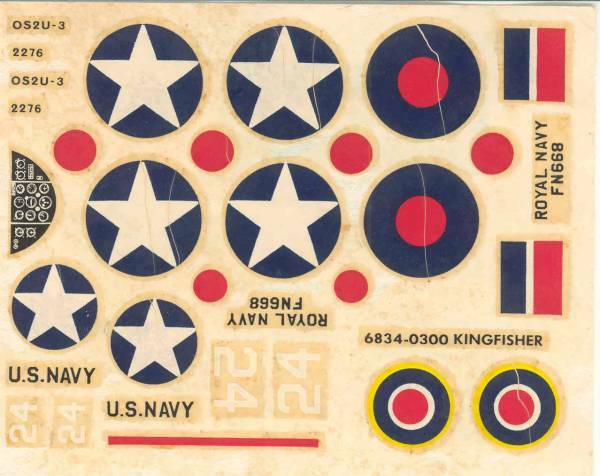 The decals that came with the kit are long past their prime so a new set will need to be acquired. Fortunately there are some aftermarket sets available. To see what the original set looked like see below. The instructions are printed on an 11" x 17" page printed on both sides and folded in quarters. The front page has a photo of the assembled kit and a brief history, the next two cover assembly and the last page shows the modification for the land based version and has painting and marking information. Now for the goodies. First up is the Cutting Edge corrected floats kit [CEC48317]. 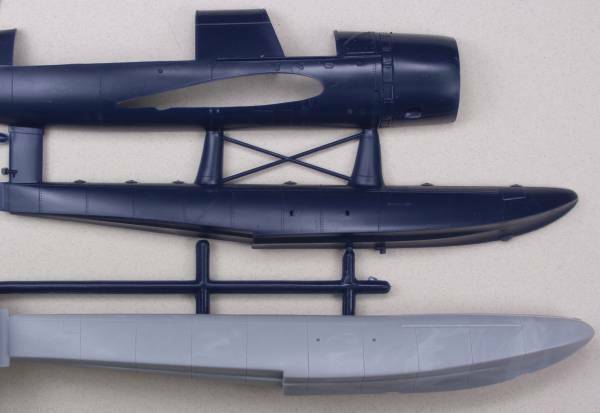 The kit provides the main float and the two outrigger floats, the three mounting pylons, a rudder and rudder extension, a sled hook (for towing) an eye bolt and rigging fairings. 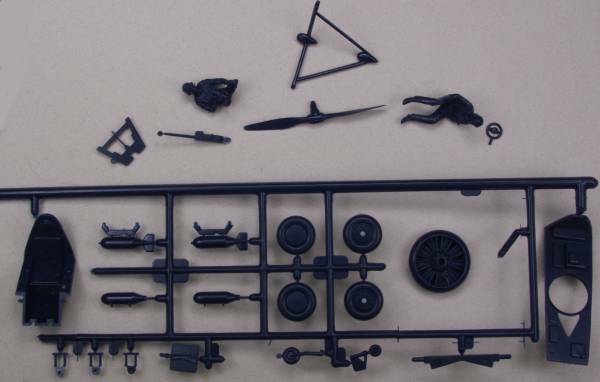 The parts are molded in a gray resin and are exquisite. The main float is solid resin with recessed panel lines and indentations where the pylons and other parts mount. The casting block is at the narrow end of the float which making removing it quite easy. The outriggers are much the same. I found no surface defects or short shots on any of the parts. The instructions are on an 8 1/2" x 11" page printed on one side. See photo below. To give an idea of how undersized the original kit float is see the photo below. Next up is the Cutting Edge Corrected Cowl set [CEC48301]. 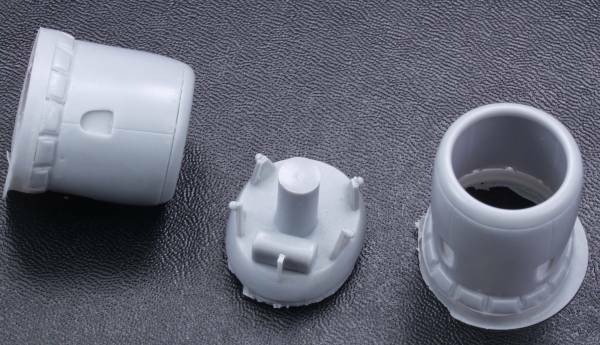 The kit part has the engine molded integral to it and this part allows you to install a separate engine. Why I got two cowls with mine I have no idea. They appear identical and the instructions make no mention of a second one. One did have a small glob on it but certainly nothing that would have been hard to fix. 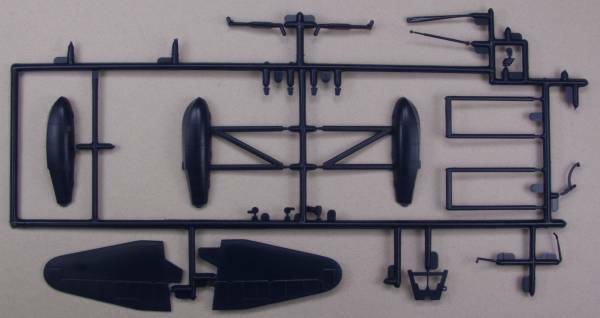 The kit also includes a firewall with and oil tank molded to it to provide a mounting for the cowl and engine of your chose. Unfortunately Cutting edge does not make an engine for it. I procured a replacement engine from Engines and Things [ENT48011] P&W 985 Wasp Junior engine, but I am not very happy with it. The detail is soft and it has a lot of flash to clean up and I'm currently looking for other options. The instructions consist of half an 8 1/2" x 11" sheet printed on one side. See photo below. Now for the real goodies, the Cutting Edge Cockpit set [CEC48300] Unlike the other two sets described above which come in bags this set is actually boxed. It includes a pilots tub and radio operators tub which encompasses much of the rear fuselage, pilots seat with harness and belts, radio operators seat with belts, a radio rack with life raft, fore and aft bulkheads, instrument panels with film for the instruments, a duplicate set of levers a stick and gun for the radio operator and a number of other parts as well. 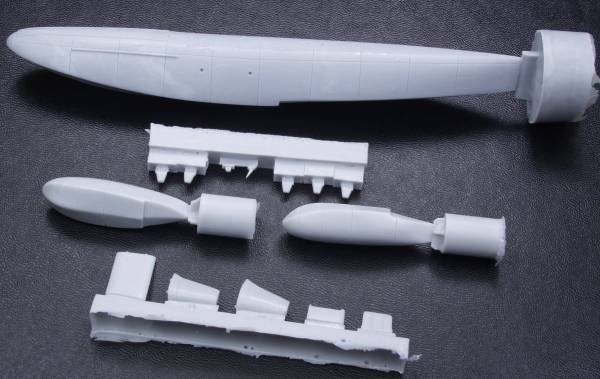 Since the original kit required that the wing assembly slide through a hole in fuselage the center portion of the wing must be removed to use this set. This would leave the wings rather weak so there are a male and female resin parts that get glued into the wings and carry through the fuselage between the crew and provide a solid attachment for the wings. As usual the level of detail, absence of pin holes and the crispness on molding is typical for Cutting Edge. The instructions are on an 8 1/2" by 11" page printed on both sides. While brief it does provide enough information to complete the modifications required. See photo below. 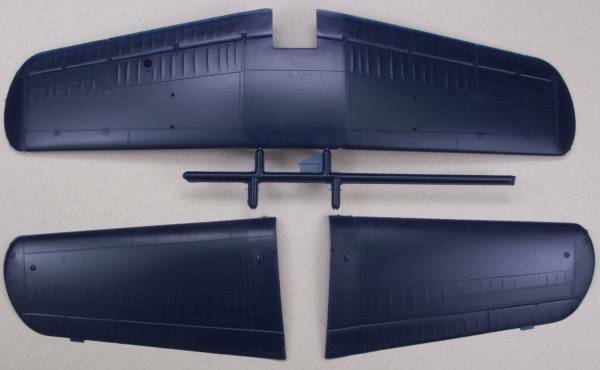 Although I'm not sure whether I will use it or not, I did obtain a Squadron vacuformed canopy set  as well, See below. An easy build this will not be, however if one is careful and follows Cutting Edge's instructions to the letter it should not be any more difficult than many of today's limited run kits. In many ways it will be easier as the basic kit parts all fit well. When complete you will end up with a real jewel that will match any of today's state of the art kits in the level of detail. The kit is not for those squeamish about using a razor saw. Due to the amount of resin parts and the amount of original parts butchery required I would recommend this modification only to those with experience with resin update sets.